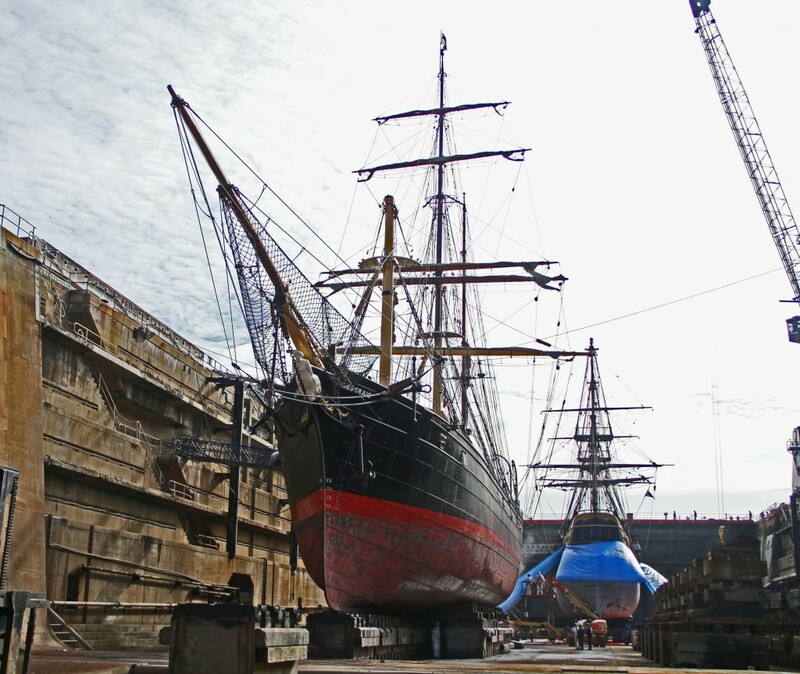 Enter the Sydney Heritage Fleet’s (SHF) shipyard at Rozelle and it is hard not to grin. In fact the smile will probably be from ear to ear, because it’s the closest thing you’ll find to man heaven. Damian Kringas explains. 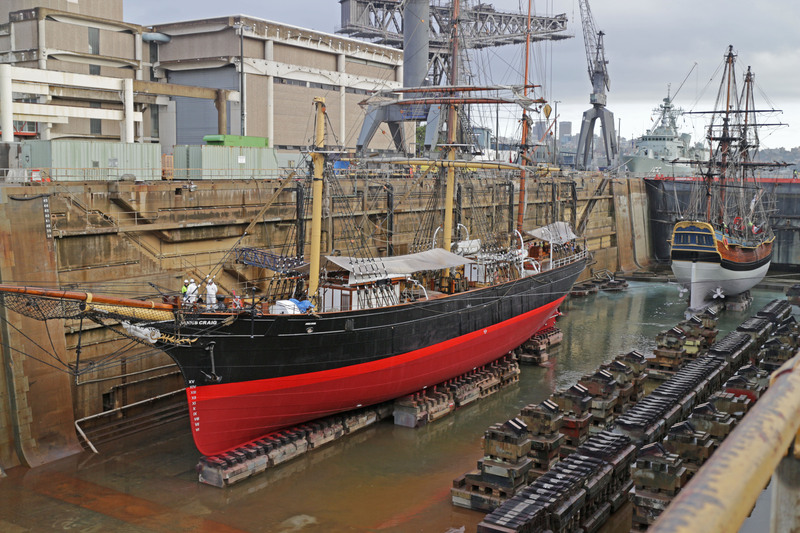 On the edge of Rozelle Bay, just down from the Anzac Bridge, the yard is most famous for turning a half-buried hulk found in Tasmanian mud, into the glorious ship that is the 1874 built, James Craig. Visited by thousands of maritime enthusiasts and tourists at its Wharf 7, Darling Harbour mooring, it’s one of only four tall ships licensed to carry passengers left in the world. As the flagship of the fleet, its resurrection/restoration is the core of what the SHF does. But there’s more. The James Craig left Rozelle in 2001 and now the yard is even busier. Between 50 and 70 volunteers clock on each of the six days a week that it’s open; many working harder than they ever did in paid employment. The lathes, drills, milling machines, bandsaws, rippers, thicknessers, welders and grinders all clunk, buzz, hum, spark and cut to a backdrop of hammering and loud conversation. Opinions swapped, measurements double-checked (measure twice – cut once), adjustments made and then more hammering. Many working harder than they ever did in paid employment. Most of the blokes that work at the yard are feet and inch type of guys – most old, but not all. Most highly skilled-years of experience, but there are exceptions. Some are here for the experience, some for the social bonding, some to get out of the house, some just for the spectacle. Because it is a spectacle. The Archer 60 ton hydraulic press, Hafco 15” planer, Asquith drilling machine or the Macson 18” swing lathe. It provides an opportunity to see some real old school making, either from wood or steel, done with tradition – rebuilding boats and ships from a time slowly being forgotten. The 1912 double-ended inner harbour ferry, Kanangra is tied to the dry dock, precariously as it could sink at any time. The last Sydney ferry of its kind, she’s waiting her turn on the dock to get a new steel-plated hull. Apart from the hull, the ferry is mostly wood (Australian red cedar, NZ cowry and American redwood) giving the chippies more than enough to do. Former baker, John Howell is a six-year veteran of the fleet. He joined up after retiring as he’d always harboured an interest in boats, but shared the common belief; “the best boat is someone else’s.” He ended up on the Kanangra and sums up his fondness for the fleet in terms of the social interaction. “I enjoy coming each week and talking to the blokes, listening to the blokes in the tucker room. I often just sit and listen,” says John. The John Oxley, Australia’s last surviving coastal steamer. The top deck of the Kanangra is the temporary home of the Pyrmont Ultimo Glebe Men’s Shed. In arrangement with SHF the PUG Men’s Shed operates like any of the other 720 or so sheds in the AMSA, with the added responsibility of restoring the Kanangra’s windows, doors and seats. Once a permanent location is found, the Shed and SHF restoration work they do will move. Another wooden boat sits amongst the vast small vessel collection, the Kookaburra II. In a large shed just up from the shipyard, the 25ft Chris-Craft designed, Australian-built 1954 pleasure boat is stripped back, waiting for her refit. Originally powered by a straight eight Chrysler, the Kookaburra II seated 19 and was a joyride fixture working out of Manly. At 2.9 tons she wasn’t that fast, but the noise of the great engine and sight of the spray guaranteed her popularity with day-trippers. Sitting on the submersible dry dock is the John Oxley, the one everyone looks at when stuck in traffic on the Anzac Bridge. It is Australia’s last surviving coastal steamer. Scottish built in 1927, she’s 760 tons of steel, not welded, but riveted. Like the Sydney Harbour Bridge, one-by-one orange hot low carbon steel rivets held in place, then the small end slammed to make it fasten. Each of the ship’s hull plates have been replaced, adding up to thousands of new rivets. 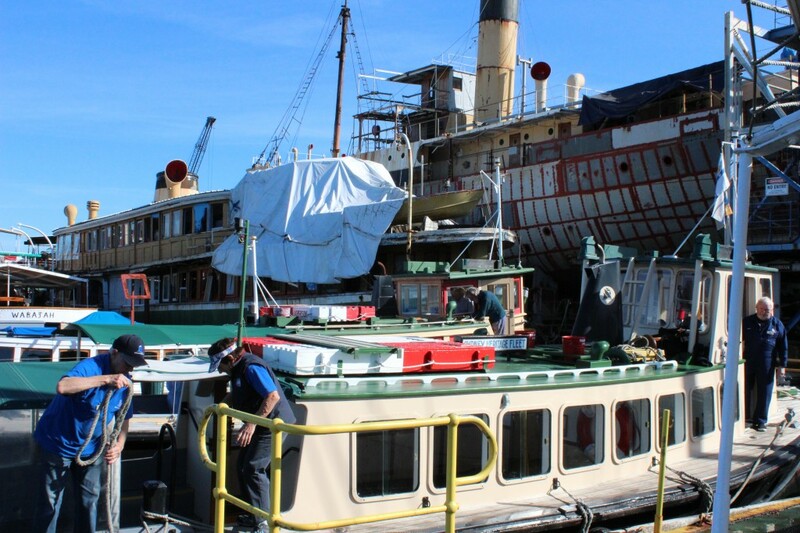 The James Craig left Rozelle in 2001 and now the yard is even busier. A hole is drilled in the 10mm thick sheet steel (8mm for the deck) and then countersunk – that gives it the bond strength and the flat-end finish for a smoother hull. 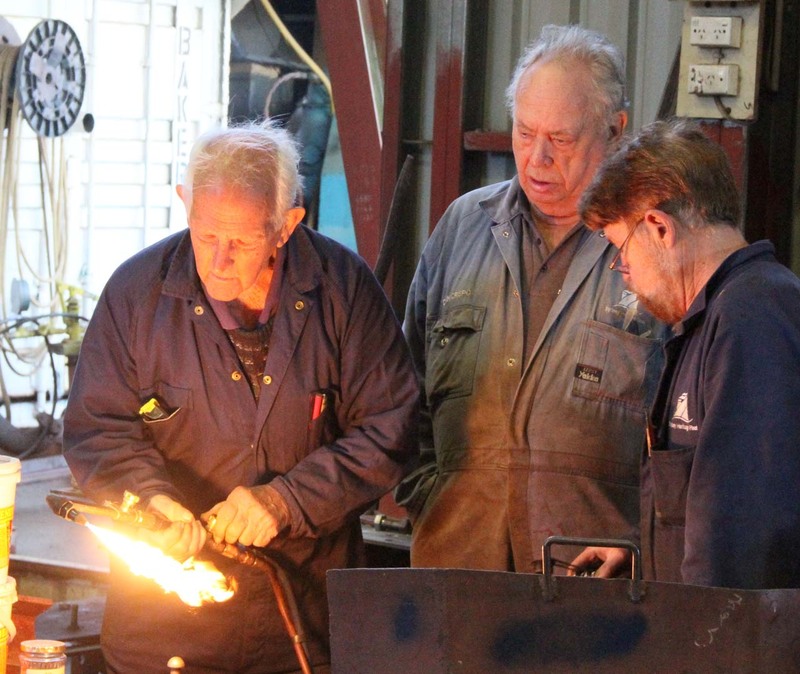 On the hot rivet team, retired TAFE teacher, Don Harvey explains the finer points of joining steel, before welding became the way to do business. 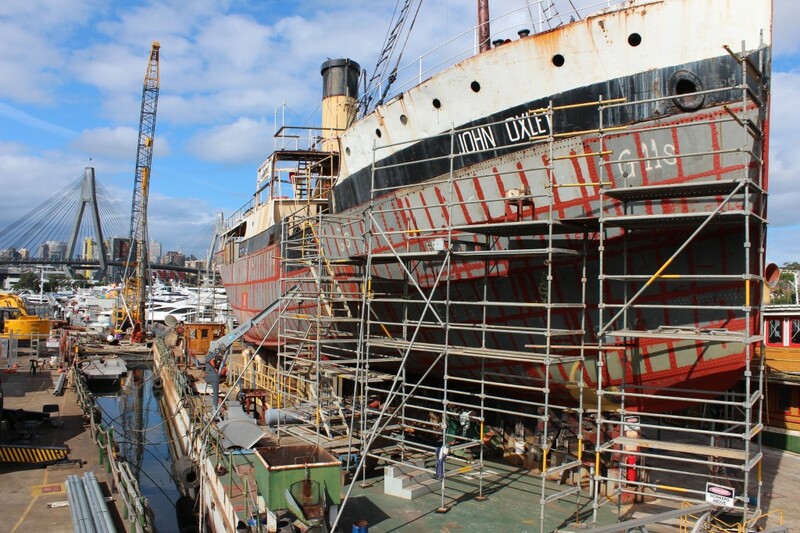 It is estimated the John Oxley will have about 30,000 new rivets by the time she’s relaunched. Not all the volunteers make and repair. Jobs are diverse and exist in the office, as tour guides, hospitality and in the archive. There’s enough to keep people more than busy. Many choose to crew the vessels in the fleet. Tied to her own mooring is the 1903 Australian built ‘gentlemen’s schooner’, Boomerang. Donated to the SHF by the Albert family (of Alberts Music fame) the schooner is a popular fixture on the harbour. Master/chief engineer, retired fitter and turner George Von Martini is a 10 year veteran of the fleet. 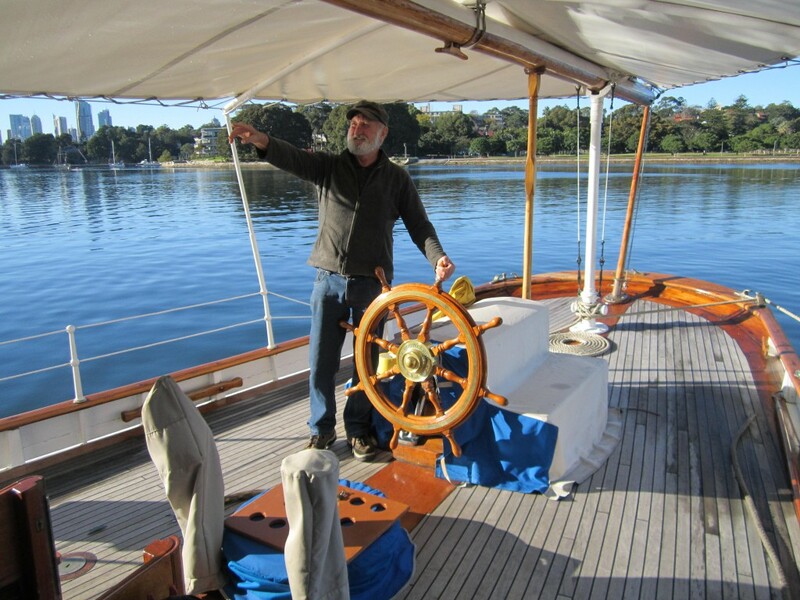 A keen boating man, George has a love of Sydney Harbour, the fleet (the long morning teas and longer lunches) and especially Boomerang. “To me it’s about Boomerang. It’s a beautiful boat, 110 years old, but has modern lines. I fell in love with the boat”. George sailing on the water. The existing steel on the John Oxley, like the infrastructure deemed structurally safe enough to stay, has to be needle-gunned back to bare metal and sealed with Phoenix Metalfix 1000, ready for final painting. A highlight on the John Oxley is the Michell Thrust Bearing. Not just because its development made a huge impact on shipbuilding worldwide, but because it was an Australian who invented it, George Michell (patented in 1905). There’s a definite sense of pride, climbing into the bowels of the John Oxley to show visitors the bearing, although for a detailed explanation of how it works you’d have to ask retired shipbuilder Barry Jones, an original founder of the SHF and a member of its brain trust (he has a specially designated chair in the lunch room). If you’re new to the yard, standing on the dock with your hands in your pockets often solicits a request. That’s a pretty good description of about half the blokes on site, although not all are called Dave. A lot are ex-Navy, ex-dockyard, ex-ferry which is where that sense of team comes from – but the question is: why do so many turn up for work? It’s diversional therapy not rocket science. Australia’s maritime history on display. Most men have a sense of purpose hammered into them from an early age – provide a home, feed the family, buy a house and work hard. When work life significantly shifts or ends, for whatever reason, that’s often when the hard stuff begins. Too much time at home, boredom or the dreaded black dog – some revel in the opportunity to pursue a lifelong interest that has no real point other than distraction, like breeding greyhounds, model railroading or brewing beer (although making beer has significant social and scientific rewards). For some it’s about quality of life, self esteem, others need the social interaction and physical activity – just like the good old days and that’s where the SHF kicks in. The standout at the Rozelle shipyard is not, as you’d think, the preservation of Australia’s maritime history. Although that’s what it does and does well as a prime example of a working museum on a beautiful working harbour. The golden moment is seeing a whole bunch of blokes working with a sense of purpose so strong that it’s hard not to get emotional – although real blokes don’t, they tell me. From men with and without a maritime background there’s a collective call – we’ve got to get that boat fixed, together, as a team and a team it is. And in this day and age, it’s a beautiful thing to see. Damian Kringas is a Sydney-based writer and historian, currently studying diversional therapy in aged care and working towards his 100 hours at the Sydney Heritage Fleet.